“I just wanted to let you know that we had a great time in Costa Rica. Everything was perfect and your agency did a tremendous job. Everyone was on time and so courteous. It really was a great experience. We really appreciate your help and for planning a fun itinerary. It was really an awesome trip"
We are back from Ecuador and had a FANTASTIC TRIP! Both our guide, Sophie and driver, Carlos were GREAT! We had a marvelous time and were able to see a lot of the country. Mountain Biking was fabulous , River rafting was also a great experience. . . . Thank you so much for setting things up so quickly for us. We had a wonderful time together as a family--lots of memories and pictures for all. “We had a great trip. All of the arrangements were perfect. People showed up to meet us at the right times and places. Flights were laid out well. The Santa Cruz was a very nice boat. . . .Lots of spit and polish. Our naturalist was excellent, and we even bought a book he wrote about the Galapagos. Finally, the food and service is excellent. It was a good choice. Lou W. and Mary M.
“I just wanted to finally let you know we had a fantastic time. I loved Ecuador and her people. [Our Galapagos boat the] Tip Top ll had a great crew. They were attentive and very knowledgeable. You have found some absolutely lovely places in the Andes. I completely enjoyed the women's co-op. All the haciendas and resorts were lovely. All in all, we crossed the equator eight times total, swam with wildlife, saw an Andean condor, whistled with the boobies, and barked with the sea lions. Life doesn't get much better. “Thank you, thank you, thank you! Our trip was amazing; the country was beautiful and the care we received was first rate. “We returned from our three-week trip to Peru a couple of days ago – it was an incredible trip. Thank you for all the work you did to make it so. “Loved the trip! The tour companies, guides, excursions, hotels were all great. I only have good things to say about it. Thank you for all your help in customizing the trip. We were able to serve food to the elderly and visit an orphanage and drop off clothes which were both great experiences. “Thank you for organizing the most amazing adventure in Peru. There are not enough superlatives to describe our extraordinary trip. Everyone was friendly, professional and provided excellent service. Sheila, our guide in the Sacred Valley, is the best guide we have ever encountered. . . Her pride in her country and its history was a delight to observe. Greg and I were amazed by the special opportunities Latin American Escapes provided, such as visiting a home in Ollantaytambo, visiting a floating island without the other tourists from our fast boat, touring Machu Picchu with author Darwin Camacho Paredes, and dragging our unsuspecting guide on a tour of building supply stores in Ica. “Hi! I have been meaning to email you to tell you that Steven and I had such a super fabulous time in Peru!! Our hotels were wonderful and the guides were great! We loved every minute! Thank you, thank you, thank you for helping us to plan a trip that we will always remember! I have attached a picture of us at the Sun Gate in Machu Picchu below. 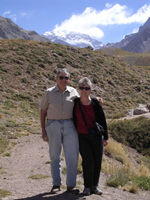 “My husband and I just returned from our Inca Trails trip to Peru and I couldn't wait to thank you for a great trip! Your local office and our local guide Holger were especially outstanding- they took care of absolutely everything, meeting us at the airports, arranging for the luggage, bringing us bottled water, recommending restaurants, you name it! We didn't worry about a thing, and as a result, we had a fabulous vacation. . . . . I should have no trouble persuading my husband to take another trip in the future, as long as we find a destination that your agency travels to! “We had a wonderful time in Argentina. Our guides were intelligent, capable, well-informed and had great senses of humor. We had high expectations for our trip, and they were exceeded. . . . . . We especially enjoyed our stays at Hosteria El Puma and Hosteria Futalaufquen because of the special ambience associated with their locations. You have just about risen to "sainthood" status with our group! . . . Everything was orchestrated beautifully and every driver/guide was always on time (actually always early), gracious, accommodating, well-informed and delightful to share the journey with. We would probably all agree that Alejandro in BA was our favorite. You were absolutely right on asking him to lead our group. Kudos to you for putting together a trip that covered the best that Argentina has to offer. There were so many "highs" and positive experiences, each competing for number one spot. The recommendations for lodging were exactly the caliber that we hoped for: unique, personally run, outstanding amenities, and beautifully decorated, not to mention comfort and the personal attention we got at each place. The food was always outstanding and paired with the incredible Argentinian wine - what more could we ask for? I could go on and on about the cooking class, the biking through the vineyards, the incredible meal in the Zuccardi vineyards, the hiking near L'Angostura and lunch by the lakeshore, getting soaked at Iguazu Falls - but then you know how wonderful it all is. Your "orchestration" for our whole experience was wonderful. Where should we go next ??? !! !